St. Andrew’s Presbyterian Church opened it’s present building for worship in 1876. This Romanesque Revival church was designed by architect William G. Storm. 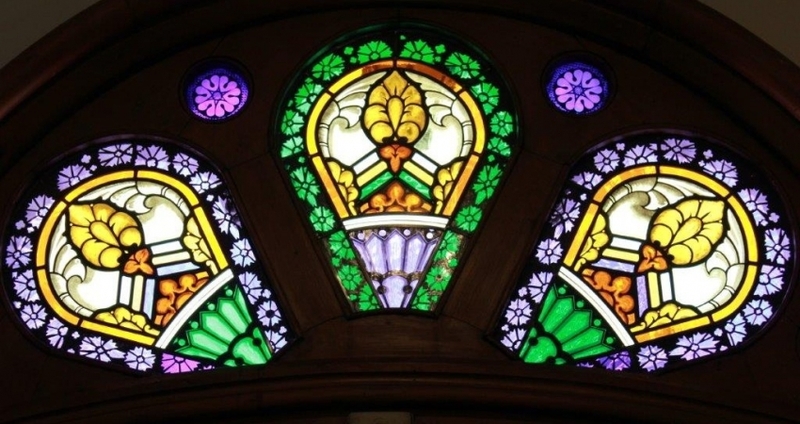 In 2015, a committee from the church commissioned EGD Glass to design and fabricate nine new stained glass panels for the tympanum windows above the three main doors at the front of the building. EGD Glass took a modern approach to the design of the windows, while taking care to incorporate traditional motifs found in the existing rose window. The existing rose window features an ornamental floral pattern. This floral detail was hand-painted onto the new windows. Silver stain highlights of yellow were added to complete the process and the windows were fired in a kiln for durability. The panels were installed at St. Andrew’s in March 2016.